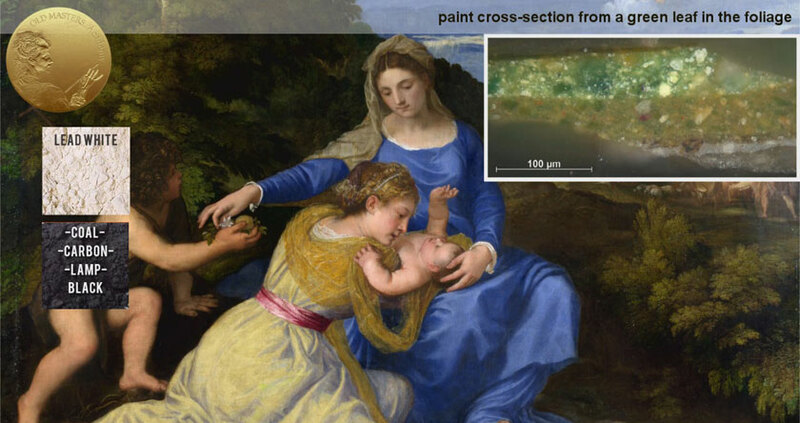 Contrary to the popular belief that Titian was using some unusually prepared color grounds, restorers, over the years, have discovered that Titian typically used a traditional gesso ground, which sometimes was covered with an imprimitura. Until the late 16th century, it was common practice in Venice to prepare a canvas for painting with an application of white gesso – that is, calcium sulphate mineral (CaSO4•2H2O) or simply gypsum, bound in an animal glue medium (usually rabbit skin glue). 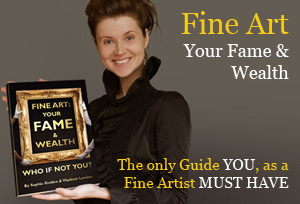 To make your life easier, you can employ a ready-to-use gesso that is available in most art shops. 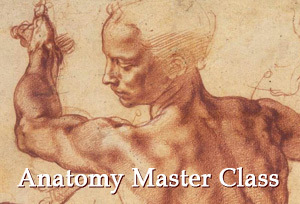 In order to avoid cracking and flaking of the gesso, artists did not apply it as thickly as they might on a wooden panel. Their aim was to fill, to some extent, the interstices of the canvas weave, but only to cover the top of the threads thinly. The artworks of young Titian were primarily executed over the gesso ground, which in some cases were covered with imprimatura. Later, when he began to experiment with darker painting surfaces, he started to employ quite dark, red-brown grounds. However, we cannot say that he was using exactly the same kind of grounds in particular periods of his life; however, some sort of tendency, nevertheless, can be traced. Gesso can be applied with a brush; but as a stiffer paste, it can be applied with a flexible palette knife. A gesso ground allows for a slightly absorbent surface. To prevent oil from absorbing into the ground, many painters preferred to seal the surface by applying a thin layer of priming or imprimitura, containing drying oil and pigments. Restorers’ research, in most cases, shows that the binder for a ground or imprimatura was heat-bodied linseed oil – or, as we call it, “stand” oil. Let’s have a look at examples. 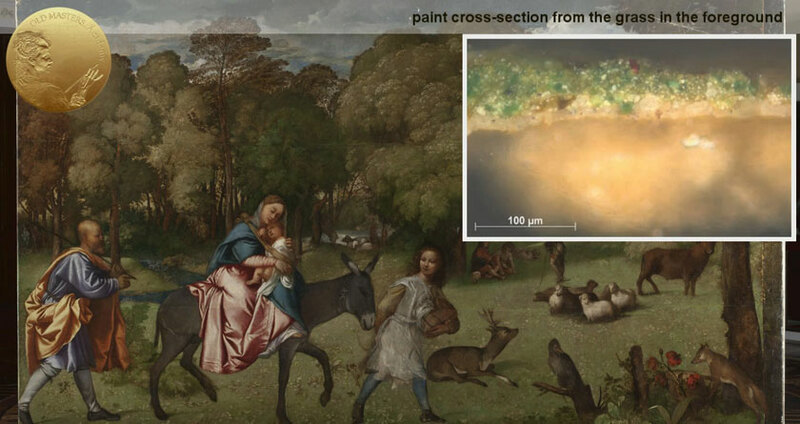 Titian’s first surviving large-scale work: The Flight into Egypt – Research of the paint cross-sections confirms that the canvas was prepared with gesso alone. Over the gesso, there is a light brown under-painting, which is then modeled with a darker brown mixture, containing mainly earth pigments and a little black, lead-tin yellow. Christ and the Adulteress – Similar to The Flight into Egypt, the canvas was prepared with gesso alone. The canvas for the Portrait of Girolamo Fracastoro was prepared with a substantial layer of gesso, which formed some rough, vertical ridges in the lower part of the sleeve, now exposed by damage in the paint film. The gesso must have been applied in a relatively thick consistency, probably with the use of a palette knife rather than a brush. Bacchus and Ariadne has no overall priming and was painted over a thin layer of gesso. The Triumph of Love is painted on a robust twill weave canvas that was prepared with gesso. There is no imprimitura. The Appearance of Christ to Mary Magdalene was painted on a fine weave canvas, prepared in the usual way with gesso and then covered with an off-white imprimitura. For the imprimitura, Titian used lead white, tinted with a tiny amount of lamp black and a very small amount of yellow earth. One more example is The Man with a Quilted Sleeve. 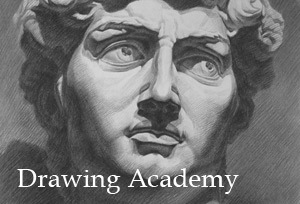 The underdrawing of the portrait was made after the application of a very pale imprimitura, comprised of lead white with small amounts of lamp black and yellow earth, was added. Stand linseed oil was used as a binding medium. 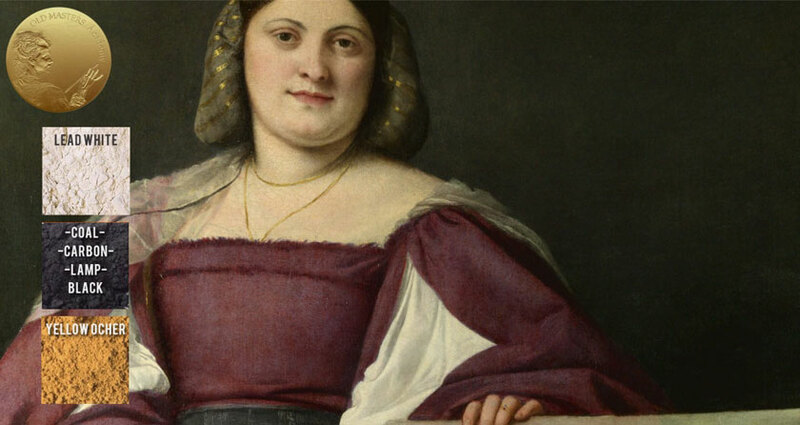 This was the typical way that Titian prepared his canvases during the early stage of his career. 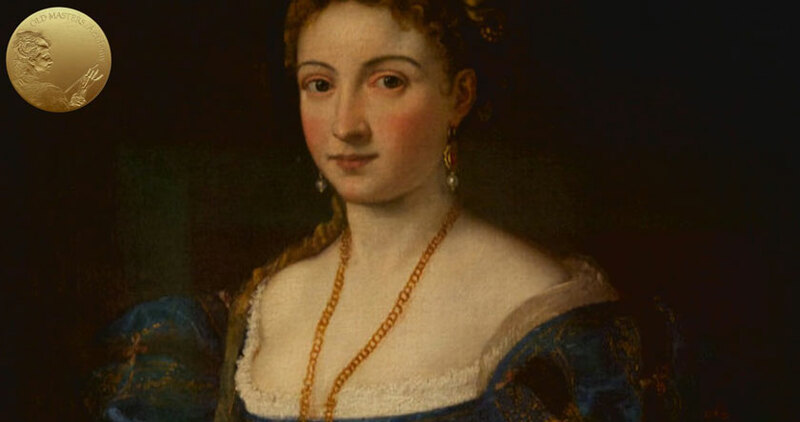 In the Portrait of a Lady, the canvas was also prepared with gesso, followed by an imprimitura. Preparation of this canvas is similar to that of The Man with a Quilted Sleeve. It is also based on lead white with a little lamp black, but perhaps included was a little more of yellow earth that makes the color of the imprimitura a bit warmer compared to the cold, greyish white on the male portrait. One more canvas from the London’s National Gallery is The Aldobrandini Madonna. The canvas was first prepared with a gesso ground and a relatively dark grey-brown imprimitura. In addition to lead white, the imprimitura contains a fairly substantial amount of black. The composition was probably drawn on top of these preparatory layers, as this seems to have been Titian’s usual practice. A rather similar type of canvas preparation occurs in the priming of Titian’s celebrated masterpieces: La Bella and The Presentation of the Virgin in the Temple. Titian also chose to use lead white with a small amount of lamp black priming in The Bacchanal of the Andrians. However, The Worship of Venus, which is from the same series, has priming that consists of pure lead white without black. 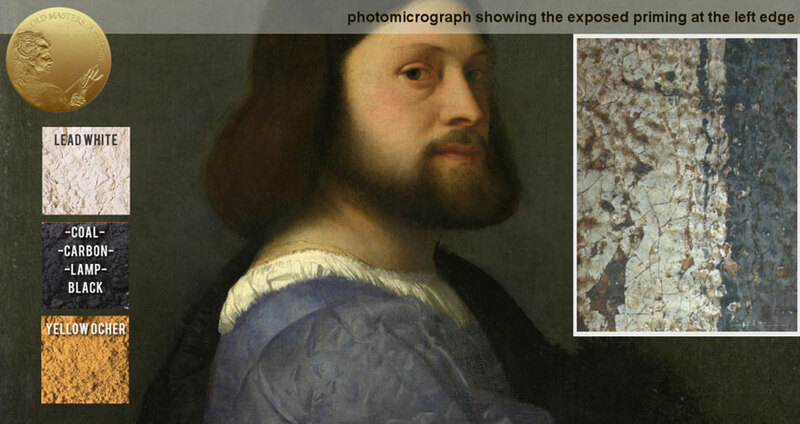 Priming layers containing lead white with a small amount of lamp black was widely used, apart from Titian, by other artists working in Venice.